Some scholars have protested that arbitrators are subject to less exacting regulation than barbers and taxidermists. The real problem with international arbitrators, however, is not that they are subject to less regulation, but that no one agrees about how they should be regulated. 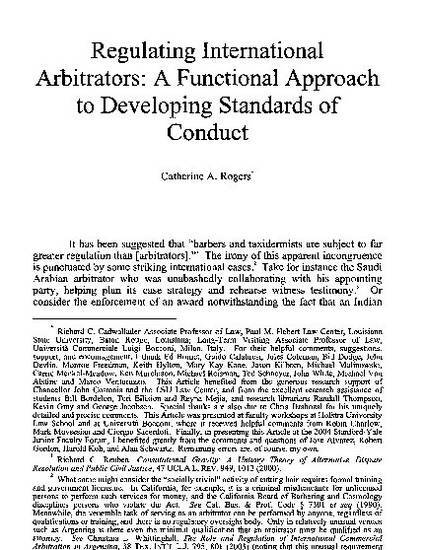 The primary reason for judicial and scholarly disagreement is that, instead of a coherent theory, analysis of arbitrator conduct erroneously relies on a misleading judicial referent and a methodologic failure to separate conduct standards (meaning those norms or rules that guide arbitrators' professional conduct) from enforcement standards (meaning those narrow grounds under which an arbitral award can be refused enforcement). These problems have become aggravated in recent years as social and economic pressures in the international arbitration system have highlighted the need for clearer standards of conduct. To develop new standards, I argue for application of what I have elsewhere dubbed a functional approach to ethics. This theoretical approach is grounded in the relationship between morality and role, and posits that professional ethical norms are designed to correspond with the functional inter-relational roles assigned to actors within a particular adjudicatory system. I develop this theory through an archetypal model that is based on Fuller's theory of adjudication. From there, I trace how shifts in adjudicators' roles reshape and recalibrate their ethical obligations in various contexts, including the various permutations in U.S. civil litigation and ultimately arbitrators in the international context. While I do not undertake to prescribe specific rules, I apply the functional approach to two particularly important aspects of arbitrator impartiality obligations - the impartiality obligations of the party-appointed arbitrator and the duty to disclose potential conflicts during the selection process. Through this analysis, I help reconfigure the underlying debate by clarifying its terms and identifying the source from which the specific ethical rules should be crafted.